The next big frontier in mainstream consumer technology is home automation. While home automation enthusiasts have been enjoying home automation for years, the vast majority of people don’t have it because it has always been far too expensive and complicated. But, as we know, Moore’s Law cures all. Suddenly, it’s clear that major Silicon Valley companies are now interested in getting into the home automation space. It’s all the more interesting because this home automation will be developed as part of the so-called “living room” experience, where every home will have a server that controls not only the all-important DVR recording of Here Comes Honey Boo Boo, but also controls the automated sprinkler system, the heating and cooling systems, the home security system and all the lights. Although there are literally dozens of specialist companies most of us haven’t heard of doing home automation, it’s more likely that the big companies we’re all familiar with will battle for the future of home computing: Microsoft, Apple and Google are the leading contenders. Among these companies, Google is currently in last place. Here’s why I want them to win. Microsoft is way ahead at present. It’s Xbox gaming system is morphing into a living room media center and home automation system as we speak, and they have both mindshare and marketshare. Google’s home automation initiative is called Android@Home. Now, it’s early days for the new world of modular, low-cost, easy-to-use home automation for everybody. We don’t really know what any of these companies will ultimately offer. But we do know a LOT about these companies, and how they operate. And based on what we already know, I know I want Google to dominate this space. For starters, home automation is a category of a gazillion hardware devices — thermometers, smart beds, lighting systems, GPS dog collars, easy-bake ovens (for grownups), intelligent fire places — we can think of hundreds of categories for home automation products, and there are hundreds more we can’t think of. Android@Home popped up in the Google I/O demo two years ago, then went into hiding. So theoretically an Internet connection could jump from one device to another to the next to the next to the next before arriving at the home router. Mesh network could also enable ad hoc networks. So if somebody introduces a new device into the network that device not only connects to the network on the fly but also enables this connection to be used by other devices. This is an interesting development for a home automation system. For example, a home security system could connect to the Internet over Wi-Fi and also to a central control computer to handle the home automation tasks. Cameras and lights associated with the home security system could themselves function as essentially Wi-Fi hotspots for the sprinkler system which could provide access and control to the heater and camera in the dog house. This enables the dog house to be connected to the home Internet connection even though it’s too far away from the central router and separated by too many walls. So that’s exciting. But now for the most promising and awesome news of all: Recently, the same source that found the mesh networking comment discovered many new “com.android.athome” references in new code in Google Now, as well as a reference to a “Card” for turning lights on and off. Like I said, it’s early days for home automation. But you’re going to be hearing a LOT about it over the next five years. 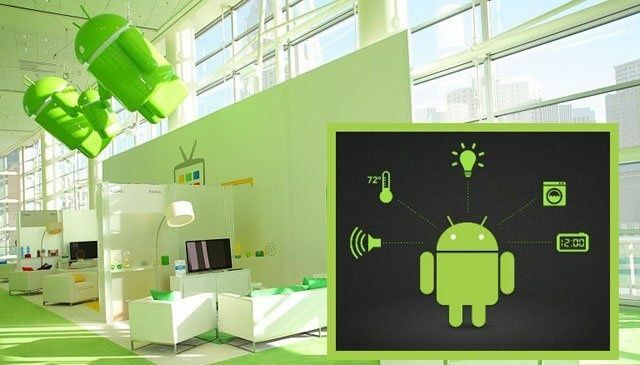 And I hope we see some major Android@Home goodies at the upcoming Google I/O on May 13. Microsoft is ahead and Apple has a market advantage. But I really want Google’s Android to control my home automation system.